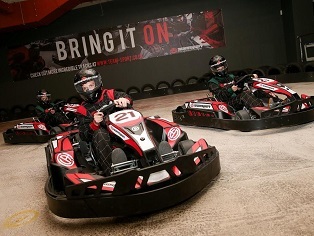 For indoor go karting with a multi level track complete with banked corners look no further. The Acton circuit has everything you could possibly need from a corporate karting venue including those nice clean battery-powered karts. Great facilities and within easy reach of central London. From Shepherd’s Bush, head south toward Uxbridge Road/A402/A4020. Turn left onto Uxbridge Road A402/A4020 and at the roundabout, take the fouth exit onto Shepherd’s Bush Green/A402/A4020. Turn right onto Shepherd’s Bush Green/A4020. Slight left onto A4020. Turn left onto Warple Way. Take the first left onto Allied Way and TeamSport West London will be on the right. An exclusive event for UP TO 10 juniors. Drivers briefing followed by 10 minute practice session, 10 minute qualifying session, 10 minute grid started race or 10 minute timed session depending upon driver ability, Electronically Timed Lap Time Printouts. There are conference facilities for 60+.